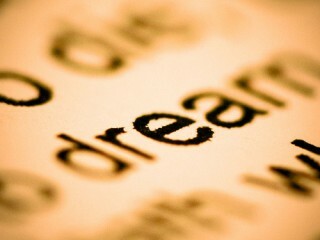 A dream is a dream, is not a dream……. There was this morning when I got up still being fascinated by a dream and still caught by the deep feeling without knowing what was going on in me and what had happened during the night. You must know I don’t dream so often or better to say I don’t remember what I dream. I know dreams are part of night life. Dreams of course are some space of mysterious experience while we sleep. Dreams are so to say the dynamics of the inner-body which …………….is to the utmost activated while the outer-body takes a rest from the day’s activities and engagements. Of course I’m also convinced of the inner balance, the necessary integration of experience by dreaming but of course I take it as it is. I take it such as getting up in the morning, washing my face, having breakfast, reading the newspaper, going to work, having fun and going to sleep again. So dreams seem to be part of the daily routine, of a routine which I to be honest don’t often think it worth to think about. It was different this morning when I woke up. It was different with this dream of a little girl living in our house. She was eight to ten years old, she was a happy girl. She was smiling, playing outside and in some way engaged in some mysterious activities. She was busy and I thought this would not touch or harm me in whatever way. It was a long dream. It was a dream which came back more often during the last night. And it was a dream, which I remembered this morning. And I remember this little girl very well though I don’t have an image of her face in my imagination. She was busy. She was running around. And then she showed me a young bird which she carried in her arms. It was a large bird, slightly brown feathered and curled up in a ball as little children do to feel safe and comfortable. The bird looked as if it was sleeping or having a rest. Curled up in a ball as if embryos do when they sleep and develop energy for the beginning of life. I can’t exactly remember if she showed me the bird or if I just got a glimpse of this bird when the little girl passed me on the stairs in the house. She was busy with this bird and I felt that she was busy with other young but big birds carrying into her house. I’m sure that we didn’t talk to each other. But I’m also sure that I felt some kind of nonverbal communication, some kind of intuitive message when we passed each other. We didn’t look at each other but we realized that we were there and that we had met and that it was important having met. These birds I think it was an eagle or some other big but young bird. The night was short but the experience felt long. The night was like other nights but the feeling had grabbed me when I woke up in the morning. The night had been like others nights. But the unknown hidden, mysterious, nonverbal message had thrown me in a different impulse of getting up compared to the other mornings, which were characterized almost in a similar way with this kind of routine I talked about. Washing face, having breakfast, reading the newspaper andsoon. Of course I knew what the deeper meaning of the dream experience was. Of course I was convinced of the unspoken message. And of course I felt being driven into live by being caught and inspired by this little girl’s eagle’s power. This was the message. This was the power of yearning. This was the power which I needed to live. And this is the power to suffer while yearning. It was the dream. It was only a dream. It was my dream last night. It was a dream symbolizing the connection between me and my power. Me and my fantasy. Me being young and being old and the same time. Me having met a sunny summer smiling girl. A girl who without being asked had answered my deep longing. A longing which is part of my life. A longing in the garment of yearning characterizes my approach to life. A longing which helps me to experience the inner body, the outer body and the relational body. The relational body between life and me. Between me and people I love or with whom I am friend with. And between me and this virtual dreamy girl. Dreams feel real. Dreams produce reality. Dreams are reality.